Bhola Plastic Ind. 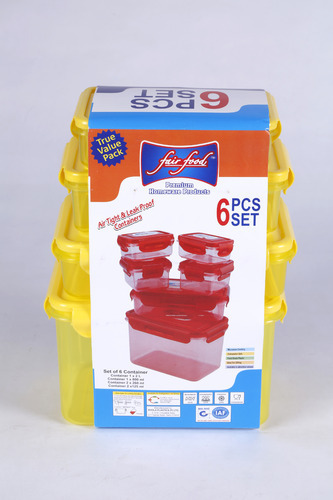 (P) Ltd. is one of the renowned organizations, highly indulged in Manufacturing and Supplying a board assortment of products such as Airtight and Leak Proof Container, Printed Airtight And Leak Proof Container, Circular Airtight And Leak Proof Container, Round Airtight And Leak Proof Container, Airtight And Leak Proof Masala Box. Our provided products are extremely accepted by our clientele for their longer life, well-built structure, water resistance, elite designs, smooth surface, and low prices. These products are made employing the advanced technique and best quality input that is obtained from reliable sellers of market. Moreover, with the help of our well-informed personnel, we present these products in varied patterns in order to meet the variegated requirements of our esteemed clientele. We select our experts through various tests and interviews. They work in adherence with the clientele to understand their exact necessities and deliver these products within the prearranged time frame. We supply Household Plastic products. Our clientele can obtain these products from us as per their requirements and needs within prearranged time-frame.